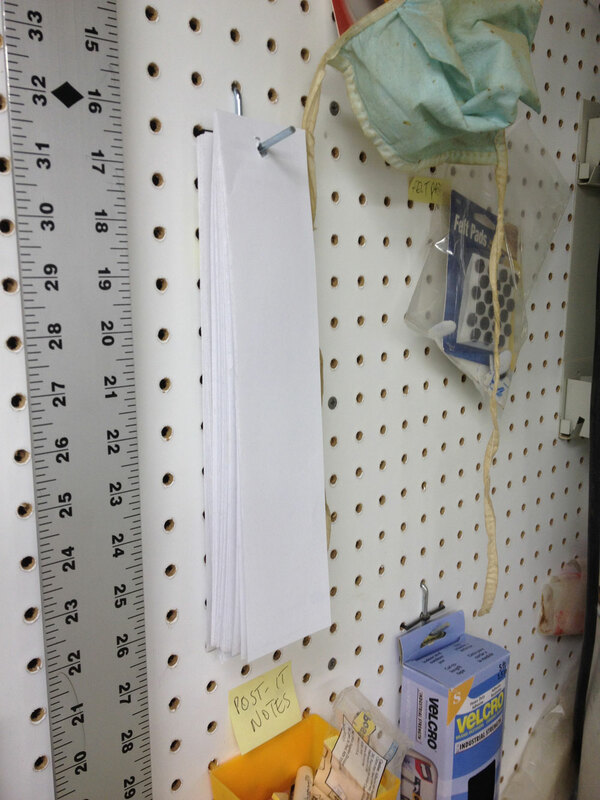 We’re always needing to write things down in the shop. 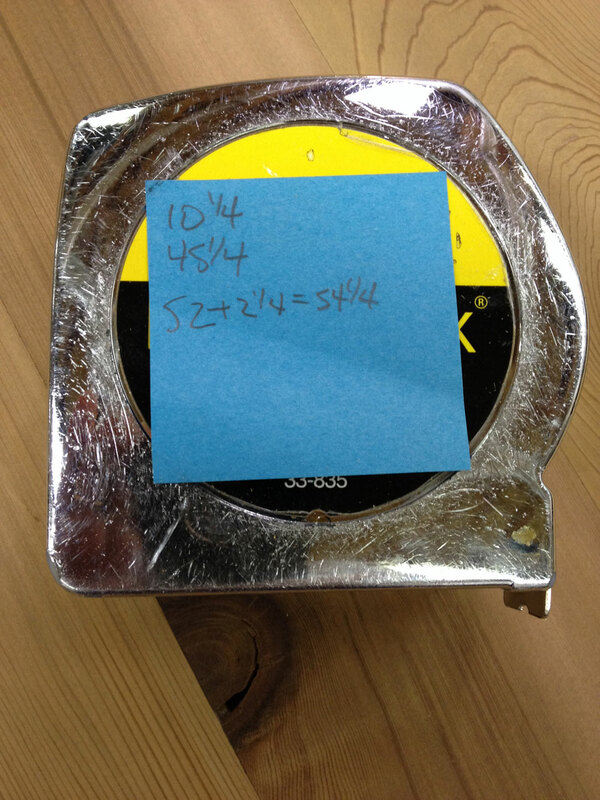 When you need a measurement (or two, or three) to take to the chop saw, a Post-It Note stuck to the label side of your tape measure will supplement your memory. I can’t take credit for that one, but it’s been decades since I read or saw the idea somewhere, so, thank you, whoever it was. I’ve been using this idea for decades, so it’s no wonder I can’t remember where I got it. When we first moved into this new house 18½ years ago, and I was building Brenda’s studio on the third floor, I went through a lot of Post-It Notes because I didn’t want to waste a trip to the first floor and not get everything I needed. Using them for measurements is a real time and materials saver. When you need to write more, this idea will help. Take some scratch paper and staple several pieces together. Now, punch a hole through the stack, so you can hang it on a peg or nail. 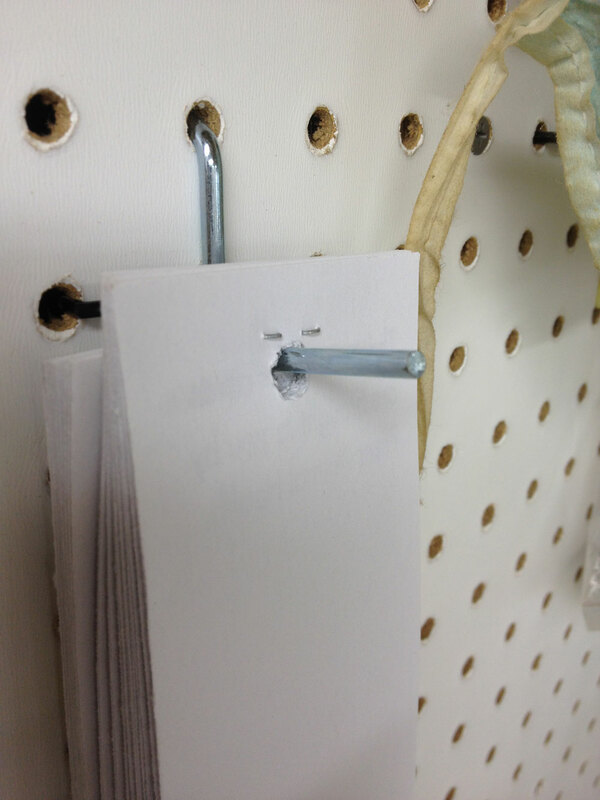 If you don’t have a hole punch, a 1/4″ Forstner bit makes a smooth hole. Why is my “scratch” paper so neat and uniform? It’s the perforated edges from the reminder postcards we send to pet owners each month, but any paper will do. I have to admit, this heavy card stock is nice! You’re not through yet! 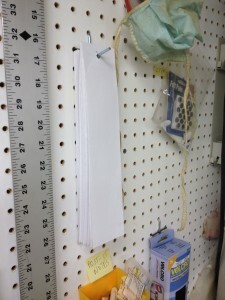 Now, when you need a piece of paper, pull from the “open” side of the staple, which will release one slip at a time while continuing to hold the remaining pieces together. 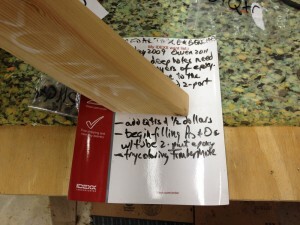 Pull from this side and the “open” part of the staple will release one slip at a time, while firmly holding the rest. Suppose you need to write even more, or make a temporary sign. Dry-erase boards work great. Some of the ones I have were free, picked out of someone’s perfectly-good refuse on trash pickup day. The others came from drug companies, and even included markers! 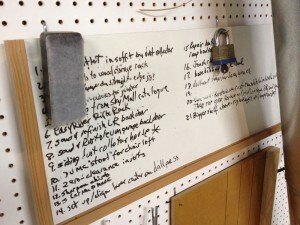 This dry-erase “board” was free from a laboratory company. It came with a marker and a plus: it’s magnetic. 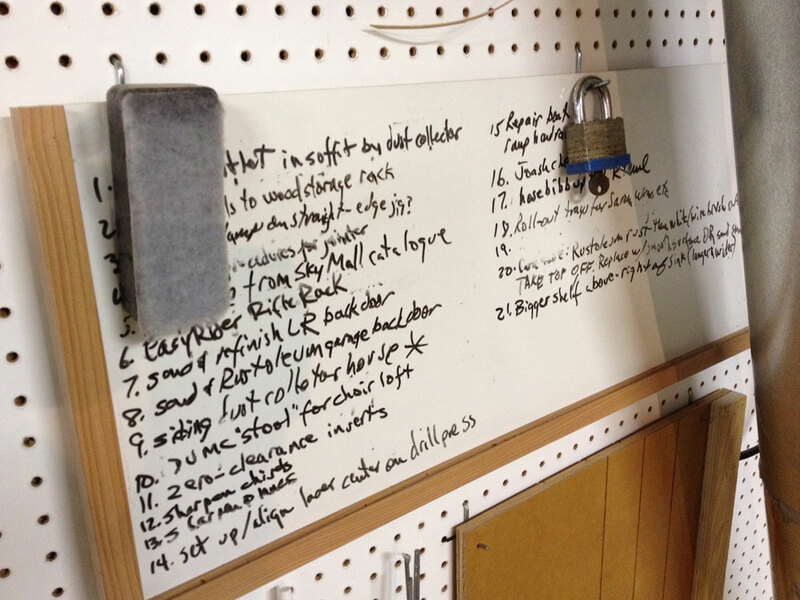 I use it to remind me what I wanted to do next when it’s a long time between shop visits.